The west coast and the area around the Langebaan lagoon has a recent history dating back to the arrival of da Gama in 1497. Although the park was only established in 1985 it has long been a source of nature and the home of wild animals, people and flowers. The first people to live in the area were the Khoikhoi or San. Evidence of their stay can be found in the form of rock paintings in the nearby mountains. They owned sheep and cattle and grazed them between Saldanha Bay and the Cape as the seasons changed. Van Riebeeck came across many of them in the Cape when he arrived in 1652 to start his supply station. However, before the arrival of the Dutch the first white man to visit the west coast was the Portuguese explorer named Vasco da Gama who came ashore at St Helena bay in 1497. From then on the area had frequent visitors from the north including the British, French and the Dutch. On arrival the visitor would lay claim to the land by erecting a post saying that the land was formally owned by the country erecting the post. These posts seemed to have been ignored by subsequent visitors as the French are known to have visited the area often and to have erected a post. The Dutch on arrival at the Cape established their northern boundary in the Saldanha Bay area and the evidence of their claim to the land can be found near "Geelbek "a historic building that still stands in the park today . In many instances the naming of a place has a story attached to it. Saldanha bay is named after Antonio da Saldanha a Portuguese mariner who discovered Table Bay and was the first white person to climb Table Mountain. Saldanha never entered the bay named after him as he had sailed passed it on his way to the Cape. The mistake occurred when Juris van Spilbergen arrived in Saldanha Bay thinking that he had arrived in Table Bay and called it Saldanha bay. The West Coast National Park not only has relics from the Dutch era but also fossil deposits dating back 20 million years. One of the oldest human remains found south of the Orange River were found on the farm named Elandsfontein nearby. Another recent discovery at Kraal Bay in the park was the 117000 year old fossilised footprints of "Eve " a homo sapien women who had lived in the area. On the western banks of the lagoon is a small harbour area named Donkergat ( Black hole). It is a military base today and access to it is restricted. However in the days prior to it becoming a military base it was a whaling station where more than 40 000 whales were slaughtered between 1909 and 1967. I can remember a visit to the area about 30 years ago and then the harbour area was home to a number of sunken and rusty hulks which once had been whaling ships. Whether they are still there today I cannot say. Archaeologists studying the park recently discovered that Konstabel Kop the parks's highest point is an extinct volcano which blew its top over 500 million years ago. No wonder the area around the lagoon is so flat. The main attraction to the park however is its flora and fauna. 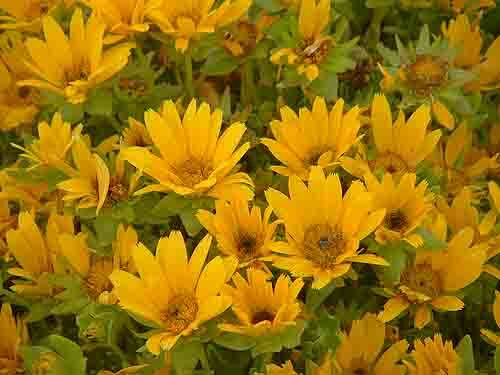 During the months July to October nature puts on a wild flower show that is breathtakingly beautiful. The fields are bathed in colours which change weekly as the flowers bloom and die and others take their place. 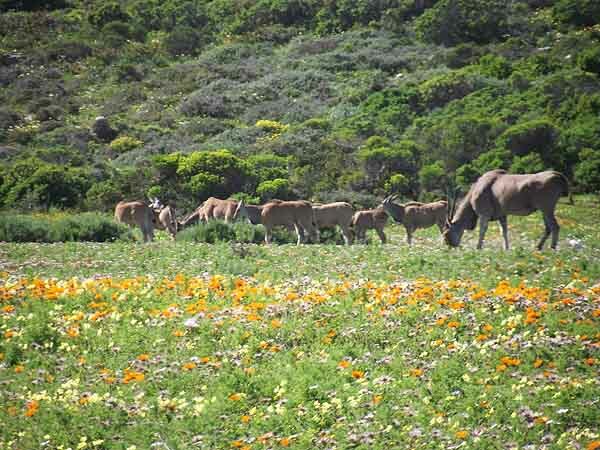 Postberg which is privately owned land in the reserve is managed by the park and opens its gates to the public when the flowers are in bloom. 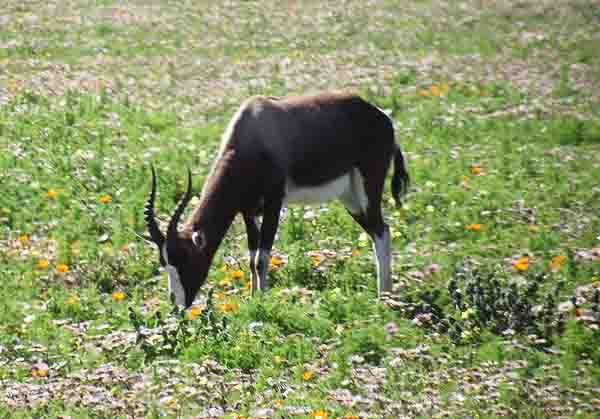 The Postberg area is also home to a number of antelope which include Eland, Gemsbok, bontebok, springbok, kudu, wildebeest and Cape Mountain zebra. These larger antelope will soon be released into the main park where they will be more accessible to the public. Smaller antelope such as the steenbok, duiker and reebok are already on display in the park. In years gone by lion would also have been found along the west coast and in the bush now forming the park. They were unfortunately exterminated by early hunters so that the Cape no longer has wild lions roaming in its area. That however does not mean that there are no cats in the park. 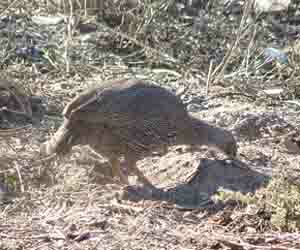 Recently, while driving through the park, I spotted a caracul or rooikat hunting alongside the road. When it saw my car it took off into the sand dunes nearby. The Langebaan lagoon forms part of the West Coast National park and where it comes into contact with dry lands it has created a number of waterways and shallow tidal basins that are frequented by migratory seabirds. All in all there are 250 species of bird making use of the park. Some of the birds migrate annually from as far afield as Siberia in Russia. To allow visitors to get close up views of the birds going about their daily lives a number of pathways and hides have been built along the lagoon. 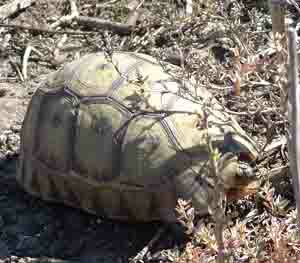 Wheelchairs can also gain access to the hides. 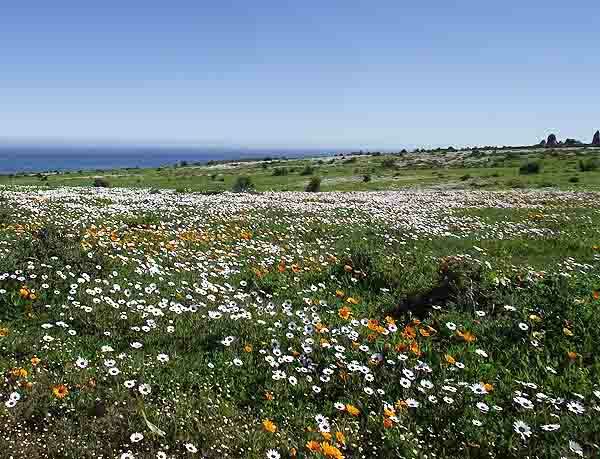 The West Coast National Park is only an hours drive from Cape Town and this year (2006) with the good rains we are having the flowers are already blooming and putting on a spectacular show. It's also time for the whales to arrive so the chances are good that you will spot a whale lazing just off the coast of the park when you visit it to see the flowers. The whales and the flowers do not wait for one so my advice is for you to get there soon if you want to see them at their best.